I LOVE Merry Axemas 1&2 I wish they did or would do more!!!! 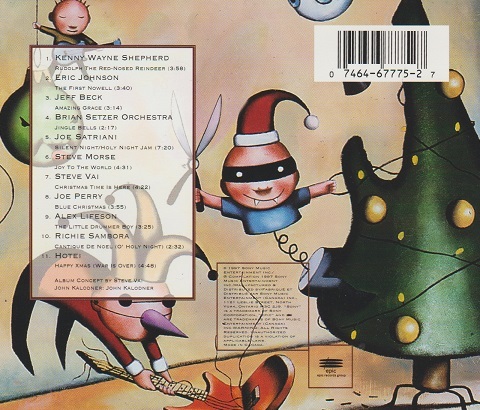 I need to bust out my holiday stuff Halford, Setzer, Steve Ouimette, Hoeys album is ok….Sure you have lots more too? DUDE! I haven’t heard the Halford one. Always been scared to. How would you rate it? Look for lots of Xmas content coming — Bon Jovi, Marillion and Twisted Sister are all set to post. its awesome. 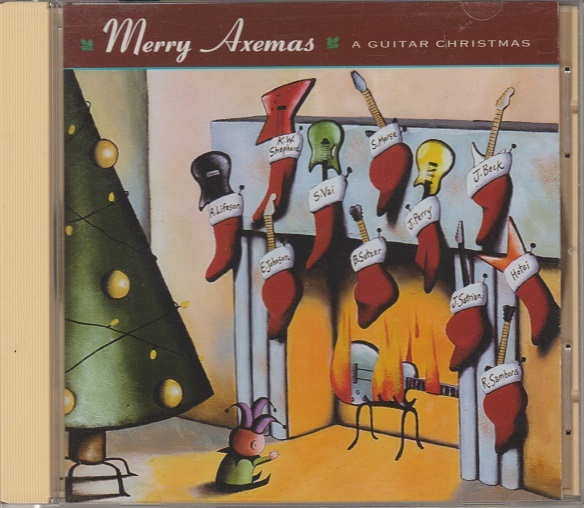 I think it might be the guitarist from Fight…Very shredder cool and musical a little over the top for the family playlist maybe but if you like axemas Id give it a shot..
Love the Merry Axemas albums… I’d say I prefer the second one though. But both great. When I play them volume 1 is the one I enjoy most. BUT…Vol 2 has Nugent and his track is insane and easily tops anything on volume 1. Yes. His is great fun! Steve Stevens is pretty bonkers too. I did hear Volume 2 first so that probably influences things. Ah yes, cue the old Whitesnake discussion for the power of hearing something first! Also there is the “grandma factor”. I’ve heard 2 less because it has fewer grandma-friendly tracks for my mix CDs. I heard your grandma was a big John Sykes fan though! Any love for the new Cheap Trick album Mike? Yes sir I heard it and thought it was great. My word. How good is Run Rudolph Run? Righteous. Their best album in forever. Glamtastic. I think I might like this one. I will keep an eye out for it. Thanks. Even if just for the Sambora track, there’s value here for you! This sounds worth a check out. My Christmas album is Bob Rivers and Twisted Radio’s “I am Santa Claus.” I also have a couple of self made compilation CDs for Christmas as well. Your offering is something different. Do you know who produced I Am Santa Claus? No I didn’t know that! He did a great job though. I am a sucker for Christmas music so this sounds perfect for me. Hope you enjoy! I’ll have lots more Xmas music this month. Haha this does look cool, nevertheless! I think it’s a Steve Vai brainchild. You can always count on him for something weird! I dig it, it’s just that Christmas music does not make me festive. Maybe wailing guitars would help? I dunno. I haven’t heard of these, but I need some new Christmas music… guess I’m gonna have to look for these! Stay tuned, I might have a couple more for you! I haven’t heard of this either and it seems interesting! Love blues and saw Kenny Wayne Shepherd, he’s phenomenal. Oh I’m jealous that you saw Kenny Wayne. He’s phenomenal! Anytime you get the opportunity, I highly recommend it! I’ve slowed down on the Yule tunes but I would grab this one. Setzer sets the tone. Love that guys playing. Good one. That’s like the cheese shop in a Monty Python skit. I’m glad you brought up Setzer’s guitar work – my dad was praising him recently, surprised that he never shows up on ‘best guitarists’ lists. Now, he did use a slightly different description than yours! God he’s so good he makes my fingers hurt. And you’re right, he doesn’t. Maybe because the music he plays is considered archaic?